Define the Beautiful Woman Within You! Range of Jewelry Sets! The description of the word "Jewellery" is exactly any piece of ornament that someone uses to beautify themselves. It can be created out of almost every material known to man and has been designed to embellish nearly every body part, from hairpins, belly button and toe rings to tiaras, diamond rings, pendants, bracelets and earrings. While many of the first-class pieces are made with gemstones like diamonds and sapphires and precious metals like platinum, but there are reasonable jewelry sets too. Unique and Elite Jewellery sets! Jewelry sets are meant to provide a shine even from a distance. They represent status and usually on bigger occasions, they are worn as a part of heavy and Gordy attires. 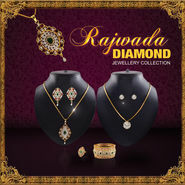 Crafted with clear-cut detailing and clean lines, jewelry sets comes in various designs and styles. Jewelry and ornaments work for every occasion and goes well with a number of clothes in your closet. 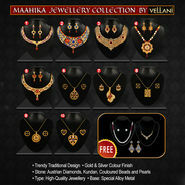 Naaptol.com outshines with its amazing collection of jewelry sets with classy designs and at a very affordable range. These sets depict quality and are chosen ones to suit the need of every customer. These sets come with pair of earrings, pendants, stones inscribed sets, pearl and silver sets and more. 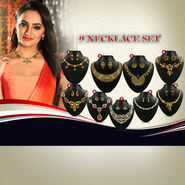 You can even get mangalsutra in different materials with unique and beautiful styles. Every purchase will let you earn some Naaptol reward points that can be used for further discounts.